It's Halloween! 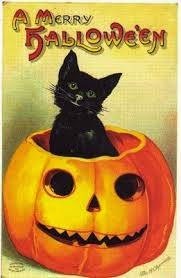 It's Samhain! Have a Happy! For many people, their biggest holidays of the year are things like Christmas or Thanksgiving. I don't actually celebrate Christmas, and I don't do much for Thanksgiving now that most of my family lives so far away. Instead, my biggest holiday is Samhain, known to many as Halloween. 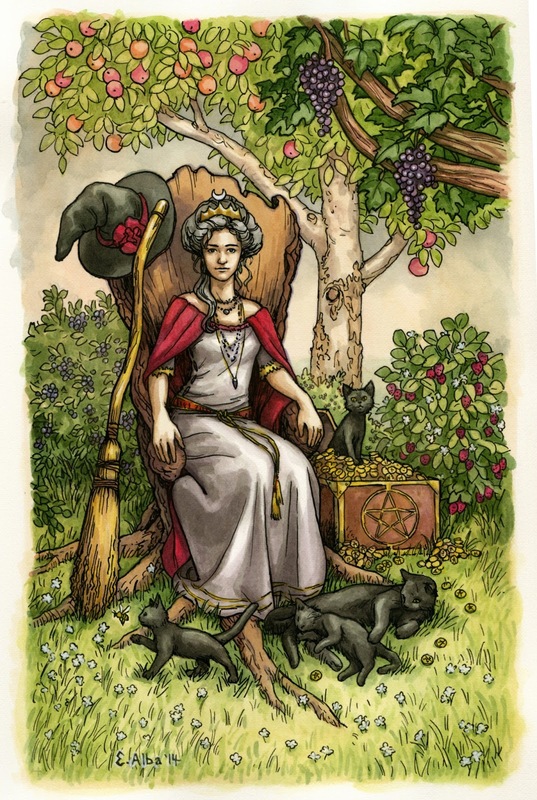 For Pagans, this is a significant day--sometimes called the Witch's New Year. It is both the end of the old year and the beginning of the new, and so it can be somewhat bittersweet. We let go of the past, say goodbye to those we have lost, speak to our ancestors...and embrace our witchy roots. Then we open ourselves to the possibilities of the year to come. At my house, I'll be celebrating with Blue Moon Circle. We will have a deeper, more solemn ritual than usual...hopefully around a bonfire outside, if the weather cooperates. Then we'll come in and feast, of course! Look what Mystic put together! There's a cute Halloween goodie bag, a copy of EITHER The Witch's Broom or one of the last remaining print copies of Circle, Coven & Grove (winner's choice), a little black cat, and a broom pen. Plus a little Halloween candy, of course. It is easy to enter. You can tweet about the contest, share it on Facebook, or, join this blog (look to the left). For extra points, you can buy a copy of either book (obviously, you'll have to get the ebook version of CC&G, since the print one isn't available anymore) and/or leave a NEW review of any of my books. Heck, you get four points just for commenting here, and telling me what you like best about this time of year. So what are you waiting for? Let's celebrate! Life is uncertain. If you turn on the news, you will be subjected to a constant barrage of All the Horrible Things. But even beyond that, there are always things that can harm us, whether they are acts of nature, acts of man, or just bad luck. There is no way we can keep bad stuff from happening once in a while, but it never hurts to do a little protection work to give yourself and your loved ones a bit of a boost in that direction. I try to do serious protection work for my house and property at least once a year, in the fall as I am shutting things down and closing up the house for the winter. The coming week, leading up to Samhain on the 31st, is a perfect time for these kinds of rituals and spells (although they will work any time, of course). The darkness is closing in as the days grow shorter, and with the veil becoming thinner, it is always a good idea to reinforce your defenses. I have full protection rituals in Circle, Coven & Grove (that one is focused on making a protection charm for your home) and The Witch's Broom, but if you want to do something simple and subtle, you can try this. Take a bag or bowl and place in it some salt (sea salt is best if you have it, but even table salt will do), dried or fresh rosemary, basil, and sage (you can also use bay, juniper, and garlic--although I'd save that one for outside work!). If you want to, you can place a protective stone like red jasper or black onyx in the middle of the bag/bowl, and reclaim it afterwards. For extra oomph, you can leave the mixture out under the full moon beforehand, or bless and consecrate it for magickal work, but that isn't absolutely necessary, since most of the power from this mini-ritual comes from your focus and intent. If you are in an apartment or don't want to make a mess, you can always dissolve the salt in water and put the entire thing into a spritzer instead (you can even use essential oils instead of the herbs if you like). There are no "right" words. Just say what comes from your heart, and focus on your intent to wrap your home and all those who live within in a cone of magickal protection. Then put the rest of your mixture away until the next time, feeling just a little safer and more secure in a dangerous world. I realize that it has been a while since I posted a Feline Friday blog. Believe me, it's not because the cats have stopped being cute. Snort. I've just been distracted by writing and gardens and fall, oh my. Giveaway ends October 18, 2014. But all this aside, we are clearly overdue for a cheerful dose of adorable cats, so I'm going to share one of my favorite themes with you--cats in the sun. Magic the Cat, wondering what the heck I'm up to with the camera. Again. Samhain, who took over the prime sunny spot on the living room floor after Magic got up. Samhain's buddy Angus coming over to say hi. Okay, no cats in this one, but isn't the sunrise glorious? Happy Friday! What is everyone doing this weekend? Contest & Celebration! Wickedly Wonderful is Coming! I guess it must be time to have a contest and giveaway! Here's the reality: People have been asking if there will be a book three. The answer is, it depends in part on you. Any day now, my publisher Berkley will be making the decision about whether or not to go with a third book in the series. They base that decision on two things--the sales numbers for WICKEDLY DANGEROUS and the preorder numbers for WICKEDLY WONDERFUL. If those numbers are good, I get to write book three and you get to read it. If not... well. Of course, you don't have to preorder the book. 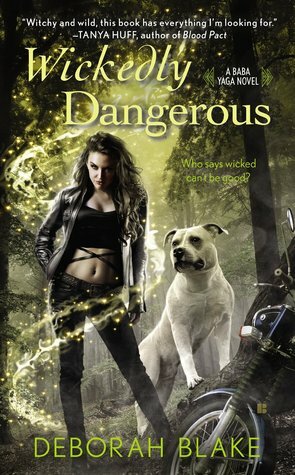 You can help spread the word, put up a review of Wickedly Dangerous (here's a secret: reviews help authors sell books). And of course, you can just have fun! ALSO, the first TEN people to enter the contest will get free bookmarks, even if they don't win. What are you waiting for? Enter! (The contest is only open to USA and Canadian residents, I'm afraid, due to shipping costs. But if you live elsewhere, feel free to enter anyway, and if you win, I'll send you a lighter-weight swag packet.) The Wickedly Wonderful link above takes you to Penguin's site for the book, which in turn will allow you to preorder from every option you can imagine. I came to find a large, fun box on my doorstep. Gods only know what my mail carrier thought when she delivered it. The lovely Robert Skinner, who made a special broom for me earlier in the year The Broom sent me a box full of broom-making supplies, so Blue Moon Circle could make one of our own together. He's even going to make me a "how to" video. We'll probably bless and consecrate the supplies at Samhain, even if we don't have a chance to make the broom itself until later. Kale with frost. Luckily, kale is hearty, and once the day warmed, it was just fine. That's the kale, which is one of the few things left in the garden, covered with frost. It was the second serious frost of the season (and the second morning when the temps hit below 29 degrees), but it got really nice in the afternoon, so that made it Time to Put the Garden to Sleep for the Winter. I called my stalwart pal Ellen, and we spend a sunny afternoon clearing the remaining beds of debris, planting next year's garlic, and harvesting the herbs. (Plus the less appealing chores like rolling up and putting away hoses and such.) The lovely weather and good company made the work go quickly, and there is always something satisfying about having the garden all neat and tidy. The end of the season is bittersweet, but this too is part of the Wheel of the Year. You can't see it now, but this is where the garlic will come up next year. And there's the kale, looking fine. The fish pond, with the filter & fountain removed. A heater will keep it from freezing over later. Lemon balm, chocolate mint, thyme, and rosemary for drying. Miraculously, I even managed to get 2,100 words written later in the day, but boy, was I tired. Still, it was a very satisfying weekend, for the most part. What did you do with yours? Did you put anything away for winter? Harvest anything good? It is definitely autumn here in upstate NY. The trees are changing color, the garden is dying back, and we had our first frost the other morning. Days are shorter and colder, and I can feel the energy slowing from the hectic pace of summer. Even if you don't live in a place where the change of seasons is quite so obvious, you will still notice the change in daylight hours and the differing energy of fall. It can be hard to stay in tune with the natural ebb and flow in these modern times, but I think we all feel better if we can do so, at least to some extent. This doesn't have to mean complicated rituals, if you don't have the time or inclination for such things. The energy of autumn is all about settling in and preparing for winter, and harvesting whatever there is to harvest (literally and figuratively). One of my favorite ways to do this--something that is practical and useful, but to which you can easily add a magical or spiritual component--is fall cleaning. I know; most people do a big clean in spring (and I try to do that too). But I'm more likely to do both cleansing and protection work around my house in the fall. It's my way of preparing my "nest" for the dark days of winter. First I start with actual clearing: I put away any clothes that won't be worn until the warm days return, make sure the harvest is tucked away where I can get at it easily, sort through closets, drawers and surfaces to get rid of things I haven't really used in the last year, and don't need to hold on to. I clean the house, getting into the nooks and corners that usually escape the more casual weekly cleanings. THEN the magical bit starts. I take my broom (thank you, Robert!) and sweep through the whole house, from top to bottom. Before I start, I may anoint the broom with cleansing oils, or dip it in a salt & water combo that also has a bit of lemon (cleansing) or rosemary (protection) essential oil in it. Then I usually follow up with some major protection work, but that's a subject for another post. I hope you are enjoying the fall changes wherever you are. What's it like in your part of the country? Does it look like this? And here is a fabulous video featuring Elisabeth and her brand-new husband, talking about how they help each other with art and inspiration. If you watch carefully, you can get sneak peek's at some of the other cards, and see her working on the ones I showed you here!